Indonesia – distant islands on the "Ring of Fire"
We awoke to a golden sunrise, casting pastel shades accross the misty valleys below - and a slight hangover. It's at times like these we realise how lucky we are to live in such a beautiful place. Travelling is great, full of excitement and new experiences - but home is pretty darn good too. We never miss home when we're away, but we're always happy to be back. A reassuring e-mail from our guide, Aris, has just come in. I will be have litle bit change for your hotel. because Now In Indonesia is Holidays time after Ramadhan.. So we've a tad more packing to do, then we jump in the truck and head to Manchester Airport. From there we fly to Dubai (7 hours), where we pick up a connection to Jakarta (another 8+ hours!). All being well, we arrive in Jakarta tomorrow afternoon. Our rather large Airbus A380 was just a little late departing, but the plus side was finding out that the flight was going to be ~ 1/2 an hour less than we were expecting. A mere 3600 miles will see us in Dubai for our connection to Jakarta. Then came bonus number two, as the nice man serving drinks offered up two cold beers. "It's a very long flight sir..."
Now it has to be said, that at least one Winster Caver is not really "into" big cities and all that, but arriving at Dubai International Airport is quite something, and one started to wonder if we sould have scheduled in a couple of days to see the sights. But with only enough spare time to get mildly frustrated with the free WiFi dropping out every few seconds, we were soon on our next plane for the leg to Jakarta. As promised our guide, Aris, was there to meet us at the airport, and before long he was deftly navigating through the chaos that was the traffic in Jakarta. It's the week just after Ramadan, a big national holiday during which the Jakartan population seem to migrate to the countryside. So as the sun set, we chatted with Aris as he drove us down to Carita Beach, continuing to dodge countless mopeds and semi-stationary cars. We checked into the (adequate) Sunset View Hotel, dined with Aris, and prepared our kit for tomorrow's jaunt to Anak Krakatau. Day 2 - Anak Krakatau. We seem to have ended up in paradise! 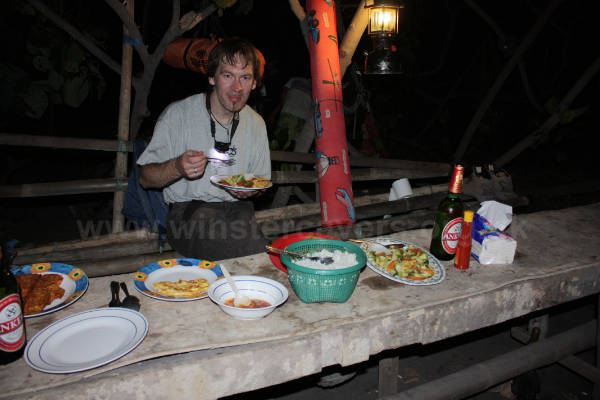 Aris and his friend met us at the hotel as promised, and after a two minute walk and very short wait, we were on the fast boat to Krakatau - a two hour ride punctuated by the boat's engines almost stalling, and an Indonesian exclamation of "OH RUBBISH"! An impressively quick faff later and were stuttering our way onwards... and as we approached the small group of islands, the boat started to behave a little better. We stopped off for a quick go at snorkelling in the coral reef, teeming with multicoloured fish of all shapes and sizes, before setting up camp on the beach. A quick swim, a bit of lizard monitoring (the lizards being of the monitor variety), and a nice relax later, and we set off to climb the active crater of Anak Krakatau (the eruption had stopped!). The first stage was reached without difficulty. The same cannot be said for the climb to the very top - it was the "usual" affair of very steep slopes of loose rock and ash on, well, loose rock and ash. But as we approached the summit, the wind changed, and we were presented with a rather nasty lungful of acrid sulphur fumes. Stupidly, we had left our gas masks in Aris' car! We thus retreated, thankfully with no serious ill effects, went for a sunset swim to wash off the dust from the volcano, and dined like lords. Our Indonesian hosts are fantastic (and Digimon "Digi" an amazing cook), the country so far is stunning too. Day 3 - to Bandung city. After a night of "Delhi belly", due we think to accidentally drinking a mouthful of water at the Sunset View hotel, we rose early to hike part way up Anak Krakatau and watch the sunrise. Aris and Digi were still fast asleep in their hammocks, so we decided to leave them to it and climbed to the first level. The sun rose as one might expect at sunrise, we headed downhill for a breakfast feast (including fried bananas with cheese and sweet cream - wicked!) decamped, and stopped for more snorkelling at Rakata island amongst fluorescent purple, LED blue, pink and green coral. A somewhat "bouncy" boat ride brought us back to Carita beach where we discovered the luxury of a traditional Indonesian shower (cold water and a pan); it has to be said it was very welcome! From here, a very long day was spent in the car, as Aris drove us back through the post-Ramadan chaos of Jakarta and on to Bandung City, where we have the luxury of a 4* hotel. Sadly the same cannot be said for many of the local inhabitants. Reliable as ever, Aris met us in the hotel reception at 8:00am. After an excellent shower and a good nights sleep in a truly comfy bed, the two Winster Cavers were feeling much refreshed, rid of their jet lag, and ready for the day ahead. The exclusion zone was duly ignored, and Aris drove to the carpark near the crater, where tea was drunk and noodles were eaten.. (not convinced quite how veggie they were, but Aris, who is looking after us brilliantly, will have checked, and they did pass the "obvious meaty bits" test!) Aris, feeling slightly under the weather (mainly due to toothache, although probably not helped by the drive) left us in the hands of one of his friends - a local guide. 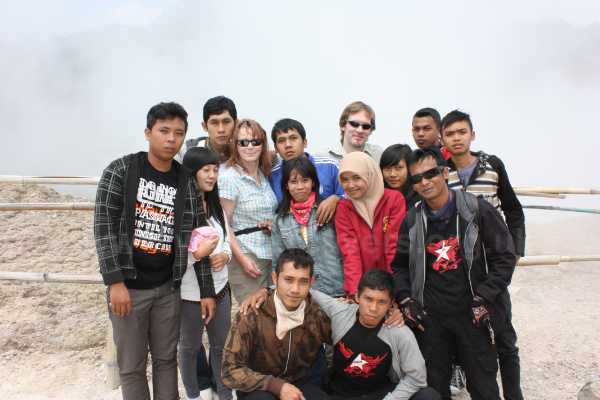 We spent some hours being shown around the Papandayan crater - with not a hint of danger over and above the obvious sulphurous fumes emanating from numerous fumaroles. The site was amazing, impressive in its scale, and full of steaming vents lined with beautiful sulphur crystals. The "new" crater was particularly interesting, as water sitting in the crater seeped through to the hot ground below, and appeared as steam from some vents above. Most glad they'd remembered their gas masks, the Winster Cavers took photo after photo after photo of his awesome place. Our guide was excellent, and great fun...... at a paticularly violently spluttering pool of boiling water, we asked "Can we take a photo from over there?" He replied "No, too dangerous" then, with a grin "I check". Seconds later,he disappeared round the corner in his flip-flops amidst swirling steam, and shouted, "OK, come". What a star. A day of travelling, from our hotel at Cipanas, near Garut, to the Baturaden mountain resort at the foot of Mt. Slamet. The "short" drive of 200km took just 8 hours(!) as Aris once more spent the day swerving in and out of the traffic, avoiding countless motorcycles and cars, buses and trucks, horses and chickens, becaks and pedestrians - his infectious laugh accompanying every close shave! We stopped periodically to photograph the lush green valleys, neatly terraced with rice fields, and of course for a bite to eat. Yet again, Aris had endeavoured to ensure the veggies were catered for, and out came another tasty variation on the theme of tofu and rice with some unidentified "river vegetable" and a blisteringly hot sambal. Over lunch we learned of a large earthquake (6.7 on the Richter scale) hitting the Indonesian island of Sumatra. We know very few details other than it has allegedly caused widespread damage, however the earthquake was not felt here in central Java. Tonight's hotel (the Green Valley) is well up to the standard we are rapidly becoming accustomed to, so having arrived well before dark, we took advantage of the outdoor swimming pool to get some gentle exercise after a long day spent in the car. From here we move on to the Dieng volcano complex, and then drive on to Selo to undertake our early morning trek up Mount Merapi. Another drive - this time through increasingly verdant valleys, every square inch cultivated - the fertile volcanic mountain sides neatly terraced with tobacco plants, potatoes, cabbages and more, and we arrived at the Dieng volcano complex. The Dieng plateau comprises many craters, and is notorious for the toxic gases that are released when the volcano erupts. We started by visiting the (rather smelly) lake, Telaga Warna, then moved on to the bubbling mud-filled crater of Kawah Sikidang, before strolling across the plateau via the ancient Hindu Temples. The whole area is a bit of a tourist trap, but we had no idea that the main attraction would be two Winster Cavers - as numerous groups asked us to pose with them so they could have photographs with the white people! If we'd been more prepared, we should have got them all to tag us on Facebook - that's where each and every mobile phone photo is going to end up! From Dieng, we drove to the famous ancient Buddhist temple of Borobodur - a (relatively) expensive tourist trap where we were surrounded by irritating traders peddling their wares, but most definitely worth a visit. We were slightly pushed for time, but Agust gave us a fantastic tour, talking us through the intricate carvings that line the temple walls, telling the story of Buddha in fine detail. From Borobodur, we continued on to a delightful homestay in the mountain village of Selo, where we were to have just three hours of sleep. Tomorrow at 1:00am we attempt the summit climb of the very active volcano, Merapi. A soft "hello" at the door of our room reminds us that it's 12.45am and we are about to undertake an ascent of the North side of Gunung Merapi, possibly Java's most active and dangerous volcano. A swift glass of jasmine tea later and Aris is driving us, Agus and our guide to New Selo from where we begin our climb. Aris isn't joining us today - he has a tooth abscess and isn't feeling well - so we say our goodbyes and head off into the inky blackness on a steep, thickly ash-laden path. Climbing through the forest we can occasionally glimpse the outline of the volcano ahead against a starry sky, and can also see a forest fire raging on a nearby volcano, Gunung Sumbing. The going gets tougher as we climb the eroded path that leads to a convenient level sheltered area, where we stop for a hot drink and a snack. Meeting a pair of French girls with their guide, it's clear that one of them is already exhausted so we agree to take the other girl with us. At the second plateau, just over a windy ridge inside the old crater, we pick up another stray hiker, this time an Israeli who can't find the route to the top. At around 4.00am we begin our final push to the summit. Just don't try this at home...... A loose and ashy steep scree slope looms before us, with a scramble either side that our French companion isn't too happy about, but we egg her on even though she's clearly getting tired. Then comes the really hard bit - a decidedly unpleasant and vertiginous scramble up crumbling rock, with the scale of our climb now revealed by the dawn light. Finally, after just over 1000 metres of ascent, we reach the edge of the active crater itself, almost hysterical with the elation at having achieved our goal. Gazing cautiously down the 200m deep vertical walls into the crater, we can see the new lava dome that is forming, complete with red-hot lava visible in a skylight. Oooerr..... As the sun rises and casts Gunung Merapi's own shadow on the clouds below, Agus raises the Indonesian flag on the crater rim on a borrowed walking pole, and we all gaze in awe at the views around us. Quite simply, it's utterly breathtaking. The descent is tough too, and everyone falls over at least once, but fortunately there are no injuries and we all finally arrive back in Selo around 9.30am for celebratory tea and pancakes before the long drive to a village near Kediri in East Java, where we are staying the night in what can only be described as a palace in the jungle! After a fine breakfast, we drove for around two hours to Gunung Kelud (Mount Kelud). More recently renowned as a picnic spot with its huge jungle-clad caldera and sparkling lake, Kelud also has a violent and merciless side, as was evidenced by the eruption in 1919 which killed over 5,000 people. In 2007, Kelud once again began a sinister and spectacular transformation, as temperatures in the lake began to rise to boiling point and beyond. A new lava dome began to force its way up through the lake, growing rapidly in size and creating an amazing scene at night as molten lava flowed down its sides, changing the face of Kelud forever. It was this lava dome, still growing (though not, at present, glowing) that we had come to see. Suitably awestruck, we headed on East, stopping at yet another roadside cafe for the some of the best veggie food we've ever had, before continuing to Batu up in the East Javan highlands where we have a comfortable huge apartment to stay in for the next three nights. Day 9 - A nice cave in South Malang - with a nasty side to it! We left our accommodation at 7:30am, to drive to South Malang, collecting a local guide, some caving kit, some fresh mangos and some lunch en-route. The "1.5 hour drive", as seems to be the norm now, took 3.5 hours, and we arrived in a small village around 11:00am at, for want of a better phrase, a local caving hut. We walked along a rough track, passing several pleasant rural houses, across a field, to arrive at the cave, an interesting-looking arched entrance tucked away behind a large dry-stone wall. A short climb down the wall and we were in - for several km of low, wet passage! But the water was warm, and even the ear-wetting ducks were pleasant. We worked our way through the well decorated passage (some was really very good indeed) stopping for photographs throughout, and for tofu and rice part way along. After lunch, and more low wet passage, we arrived at a large chamber, host to some excellent "pom-poms" of dog's-tooth spar - possibly some of the best we have seen. Then followed a long stooping passage, dropping down gradually. Progress was fast at first, until two Cavers from Winster noticed that they were becoming breathless. We carried on, and the breathlessness got worse, and the headaches started. As we emerged from the stooping passage into a large chamber, it was blatantly evident that the air in this section of the cave was extremely poor - so much so that our guide's carbide lamp would not stay alight. And we were not the only ones suffering due to bad air (lack of oxgen). Some really untimely route-faffing followed, before Aris led us up a passage in which the air quality started to improve, and within 15 minutes we reached some very welcome daylight and the way out. This was undoubtedly the worst "bad air" we have ever experienced underground and, to be honest, quite a frightening situation to find ourselves in, so a suitable warning was written in the club log-book, before we made the long drive back. We have the option of caving again tomorrow, but have decided that another early start with a few hours caving and a total of 6 hours in the car would be detrimental to us enjoying (or even accomplishing) our long and strenuous hike up Semeru the following day. The Winster Cavers need a day off! Day 10 - taking it easy. Given that tomorrow we start at 4:00am, followed by a midnight hike, followed by a dawn start, we figured that it would be a good plan to take it easy today. So after a not-too-early breakfast we drove out to look at the Coban Rondo waterfall - a pleasant place full of locals taking photographs of Winster Cavers. We were suitably amused by a small troop of monkeys, before moving on to the hot springs at Cangar. Here, what seemed like the larger part of the Batu populace had come to spend their last day of the post-Ramadan holiday, bathing in the naturally hot water. And hot it was! We dipped our feet for a while, before returning to our accommodation via a late lunch. So now it's time to relax for a little while, and get ourselves ready for our climb up Mt. Semeru tomorrow. By 4:00 am we had loaded our kit into Aris' car, and were on the road again - this time a two hour journey to the village of Tampung. We had our "medical examination", a requirement for the permit to climb Mahameru, and transferred our kit into an old Toyota 4x4. From Tampung, a 1.5 hour drive up a steep, rough track took us to Ranu Pani village, the starting point for the day's hike (2100m). Our cases were dropped at our porters house, Agus arranged our permits for the climb, rucksacks were donned, and by 8:30am we were on our way. We climbed gradually along a small paved path through verdant woodland, pausing only for brief refreshments as we went, before descending to Kumbolo Lake. Here we were greeted by our porters, fresh tea, and freshly prepared Nasi Goreng (fried rice) - now that's what Winster Cavers call good service! Very well fuelled up for the next leg, we climbed over the col near the lake, before dropping down to cross the savanna, which was just starting to recover from a recent forest fire. Our heavily laden porters overtook us, and by the time we reached Kalimati camp 2.5 hours later, our tent was erected, tea was brewed, and supper was on the go. By 8:30pm we had crept into our sleeping bags with the rather optimistic aim of getting a few hours sleep. At 1:00am the next day we were to start our ascent to the summit of Mahameru. Sleep? Oh No, not a chance! Not everyone was making the same alpine start we were - and to be fair, you can't expect people to be quiet at 9:00pm. And as the rest of the campers partied on, we lay in our sleeping bags, desperately trying to get some shut-eye. So at 12:30am, having had little more than 10 minutes sleep, we emerged from our tent, and by 1:15am we were on our way. 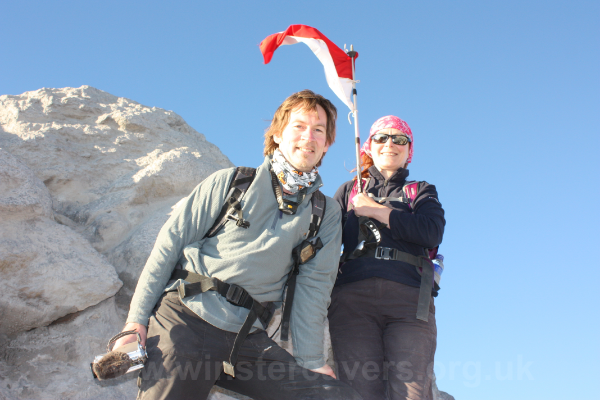 The hike from Kalimati to the summit of Mahameru can only be described as tough. Very tough. 1000m of ascent - a steep track through sandy forest at first. But the last 500m entails, scratching ones way up the loose, ashy and very steep slope of the summit cone. We huffed and puffed our way up, desperately trying to reach the summit before sunrise. Two steps forward, one slither backwards, and a deep breath of fresh, but thin air as we and a long line of other volcano enthusiasts did their best to top out on Indonesia's highest mountain. The sun rose a while before we reached the top, but reach the top we did. Which is more than can be said for many of those who had set out. Out came the flask of tea, and we sat on the top of the 3696m high Mt. Mahameru, overlooking the active volcano of Mt. Semeru. 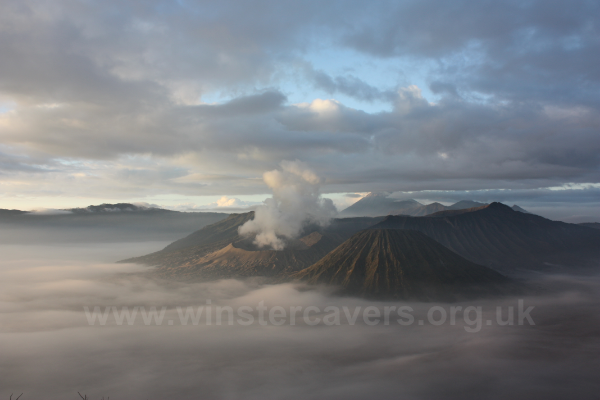 And Semeru behaved pefectly for us, emitting a whoosh of volcanic ash every half hour or thereabouts. There were photographs of volcanoes, photographs of Winster Cavers, photographs of locals taking photographs of Winster Cavers, and a very, very, very long walk out. 2 hours of "normal" driving, 4 hours by 4x4, 35.6km walking, 2000+m of ascent, 5 servings of Nasi Goreng, 1 serving of Mei Goreng, and ~1 hour sleep later, and two very tired Winster Cavers checked into the barely-adequate Cewara Indah hotel for a freezing cold shower and some necessary sleep. Our guide, Agus, and our porters were fantastic. A big "Terima Kasih" to them all for a most excellent 2 days hiking. So having just spent 2 days solid walking up & down a great big mountain, what would any sensible Winster Caver do the following day? Yep - that's right, get up at 3:30am, take a 4x4 ride to the foot of Pananjakan, hike 2km up another big hill, and sit there in darkness awaiting sunrise. But this was no ordinary sunrise - the views over misty Mt. Bromo, steaming away in the dawn light are quite breathtaking. And surprise, surprise Agus knew a little view point just away from the masses of other tourists. From here we drove across the Lautan Pasir (ocean of sands) to the foot of Mt. Bromo - the once green savannah now a lunar landscape, smothered in ash from the recent eruption. We followed the rest of the tourists up the ash-covered concrete steps, and peered in awe into the immense steaming crater. We met with Aris once more, breakfasted with Agus, and headed on to the rather colonial "Home Stay" at Blawan. Agus had given us choice. To start out to the sulphur mine and acid lake of Kawah Ijen at 4:00 and see the "normal activity", or to make an early (2:00am) start and see the "blue fire" - a total no-brainer! By 3:00am two very tired Winster Cavers had de-camped from the Blawan Home Stay, had been driven to the car park at Kawah Ijen, and were wearily making their way with Agus up the steep track to the crater. It seemed to take ages to drag our fatigued bodies up the hill, being followed by miners working the night shift, but as we reached the crater rim, Agus' promises of "blue fire" were fulfilled. Down in the bottom of the 500m deep crater, there was indeed a burning sulphur vent, roaring blue fire. We spent a while photographing and filming the fascinating sulphur mining (more to follow on another page) before dropping down to the lakeside. Litmus paper in hand, and much to the amusement of Agus, the acidity of the lake was verified... less than pH1 !!! From Kawah Ijen, Aris drove us to our final destination, the very posh but rather overly-expensive Munduk Moding Plantation. We drank a final cup of tea with Aris and Agus, took the requisite team photo, and said our goodbyes with something of a tear in our eyes. We have just shared two weeks of our lives with some very special people - we hope we will see them again.